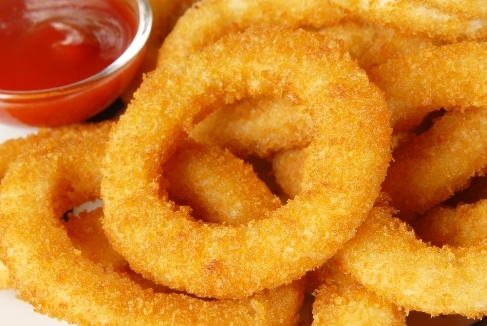 Commemorating National Onions Ring Day, our recipe for the week: Old Fashioned Onion Rings!! Dip the onion slices into the flour mixture until they are all coated; set aside. Whisk the egg and milk into the flour mixture using a fork. Dip the floured rings into the batter to coat, then place on a wire rack to drain until the batter stops dripping. Spread the bread crumbs out on a plate or shallow dish. Place rings one at a time into the crumbs, and scoop the crumbs up over the ring to coat. Give it a hard tap as you remove it from the crumbs. The coating should cling very well. Repeat with remaining rings. Enjoy this lovely recipe with some great dipping sauces bought or home-made or maybe you’ll prefer tomato sauce? whichever, just enjoy it! !